On May 26 and 27, 2018, Hedonisia Hawaii was covered by lava from the Kilauea Volcano Eruption. All 11 lodgings and 3 community buildings on the original Hedonisia property were completely destroyed. Our beloved community now only exists in our memories. We have preserved pre-volcano Hedonisia in our Archive History. However, we have not given up! In May 2019, we return to Hawaii, to rebuild our first eco-hut. In the beginning, and because of the volcano, our new community will be a smaller, quieter space of creativity and contemplation. We are calling it Hedonisia Solitude – Artist & Creatives Colony. 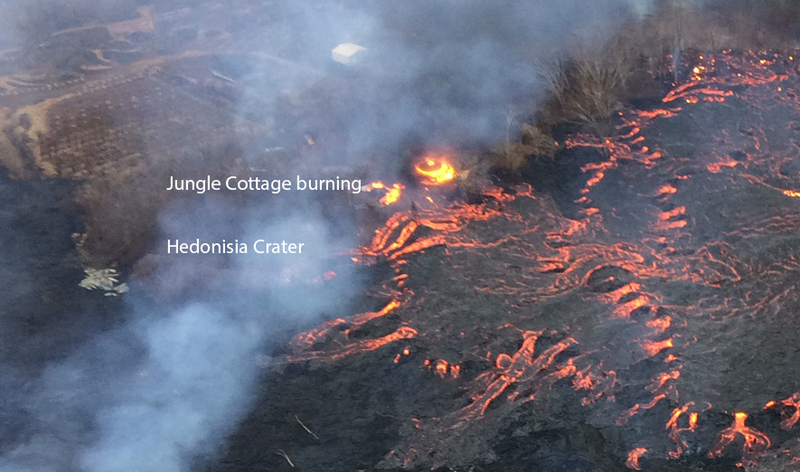 This photo, courtesy of the USGS, shows the Hedonisia property being taken by lava on May 26, 2018. My personal home was called the Jungle Cottage. You can see it in the photo. We have shed many tears over our loss. However, we have not given up. These are our rebirth options. Writers & Creatives in Residence! Phase 1 – Accepting reservations from May 2019. We own nearby property, which, and that was not destroyed by the eruption, we will start afresh with Hedonisia Solitude. Our first eco-hut will be rustic, with only minimal amenities. However, it will be located in a lovely forest of Strawberry Guava trees. Hedonisia Solitude offers scaled-down Guest, Intern and Volunteer programs for those who wish to do Heart, Body or Mind work to enjoy a discounted stay. Phase 1 is ideal for the creative person or couple who wants to enjoy affordable solitude in Hawai! Satellite Hedonisia Communities. We are negotiating with owners of three properties in the Puna area to offer variations of the Hedonisia volunteer, intern, and guest programs. One property is called Hedonisia Kunihi Nui and is located near steam vents from the recent eruption. And the other is tentatively called Hedonisia Lava Lookout as it has amazing views of the ocean and recent lava flow. Rebuild on the original land. It will take time as roads are built again through the vast area that was covered by lava. Of the nearly 4 acres that comprised Hedonisia, about 3 acres are covered in lava and is 50 – 120 feet higher than before. However, there remains a large patch of green of about 1-acre in a beautiful C-shaped ‘kipuka’ which Ocean View was once part of. Our new green oasis is approximately 1 acre in size. It would allow us to still grow plants for our agriculture needs. Hedonisia Hawaii Rebirth! Let the world know! There is a Hawaiian saying: “Ukuli’i ka pua, onaona I ka mau’u” (tiny is the flower, yet it scents the grasses all around it). It translates to ‘small things can have a great influence’. Our hope is to take the ideas we worked on in our community and bring them out to the world. Hedonisia was a unique EcoFeminist Community. We are trying to build publicity for our cause through social and traditional media to increase our chances of our story going viral and international. We created the Hedonisia Rebirth Crowdfund Campaign to help us rebuild. Even if you can’t donate, please post about us on Facebook, Twitter, Instagram, Tumblr, link to Hedonisia, subscribe to the Hedonisia YouTube Channel. Or simply let your friends know about our story by talking about it! For those who can’t make it to Hawaii, you are welcome to visit our Activist & EcoFeminist Web Portfolio, either as a customer for our products and services or to be a Virtual Volunteer! Thanks to all of you who support us and the work we are doing!